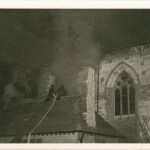 On Boxing Day (26th December) 1964 there was a terrible fire in St Giles Church in Stony Stratford and the old 2 manual organ was destroyed completely (only one pipe survives). 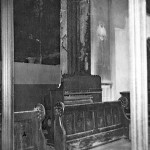 See Organs in St Giles Church for more information about the Kirkland instrument. 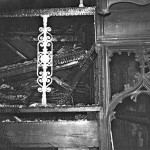 Starmer Shaw was about to restore that instrument, so when the fire happened Dr Ingram suggested to Fr Hutchings and Derek Savage that he knew of a suitable instrument to replace the old organ when the church was restored. 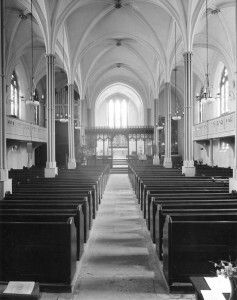 A few months previously he had inspected the Willis organ in the closed St George's church with a view to purchasing it. 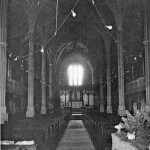 Dr Ingram had previously brought another instrument from Edinburgh in 1962 to St Mary's church Haversham, in Northamptonshire. 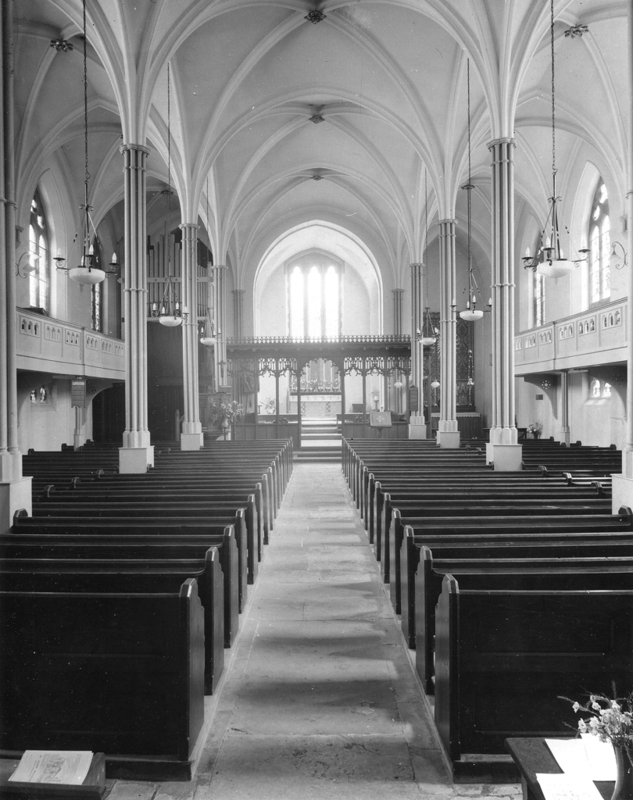 Although both Vicar and organist agreed, after they had inspected the Willis organ in storage, that it was a good instrument for St Giles church, they could not commit the church to buying the organ until the future of St Giles and the neighbouring St Mary’s church was resolved, as the two parishes were about to be merged. 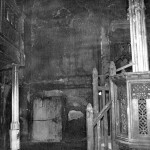 At one point there was a real chance that St Giles church would be closed permanently because of the fire, but eventually it was decided that the larger St Giles would be restored and St Mary’s church closed. Relevant extracts from the minute books of this period have been transcribed as part of the organ history research (they are held at the County Archives in Aylesbury, Buckinghamshire). The Willis organ was purchased in 1967 (according to Cyril Brown who was churchwarden at the time Fr Hutchings paid the deposit for the organ himself) and installed during 1967-1969 in the church by Starmer Shaw organ builders. 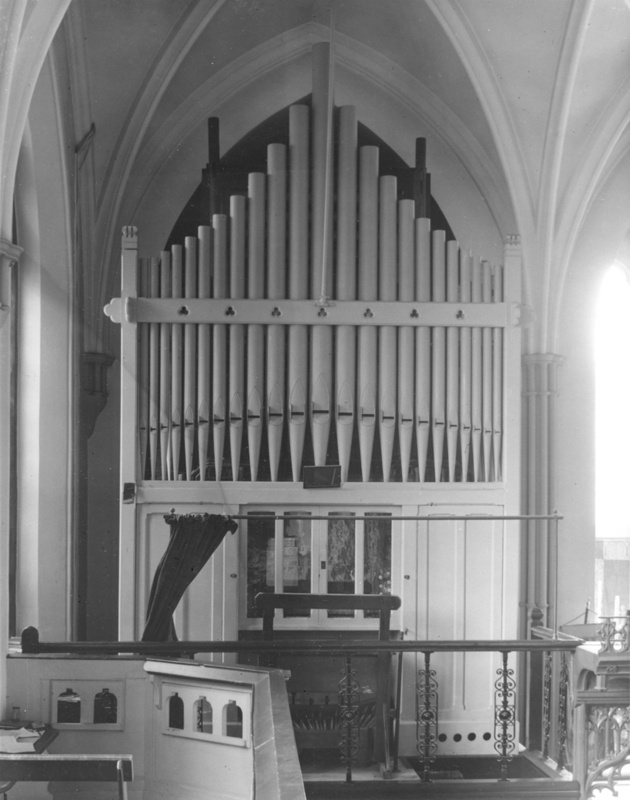 The pipes missing from the Swell organ which had been stolen from St George's Edinburgh were mostly replaced with new pipes made by Palmer's Pipes of Finchingfield, Essex. Only the Waldhorn pipes were not replaced (probably because the space for the organ was tight). St Giles church became St Mary and St Giles Church in April 1968 when Fr Cavell Northam was made vicar of the now combined Parish (Fr Hutchings and the retiring Fr Payne of St Mary’s helped the transition throughout and Fr Hutchings moved to another Parish). During his final years at St Giles church, Fr Hutchings wrote a column in the regular St Giles newsletters for his parish, these have been transcribed from the originals (held in the Parish Records box). 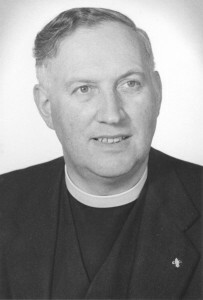 Fr Hutchings cared deeply about music making at St Giles Church (he directed the choir, with Derek Savage as organist). In 1967 he wrote a letter to his parish about the importance of the choir in worship and the community. 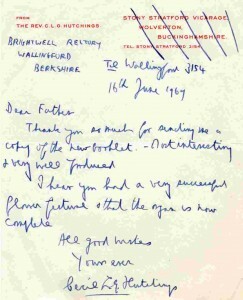 His letter of 1969 from his new parish to Fr Cavell-Northam thanking him for the booklet about the new Parish of Stony Stratford indicates that the organ wasn't completed until 1969. 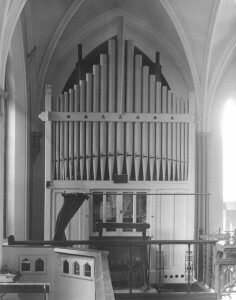 James Odell recalled the Willis organ coming to Stony Stratford (he wrote his recollections in 2006 when fundraising started for the complete restoration). Cyril Brown wrote down his recollections of the 1964 fire and its aftermath (in 2015). 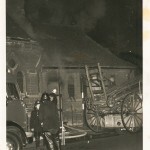 In May 1969 a week long Flower and Organ Festival was held in St Mary and St Giles to celebrate the organ installation and raise much needed funds for the restoration of the church because insurance after the fire had not covered all the costs and further restoration work was needed. 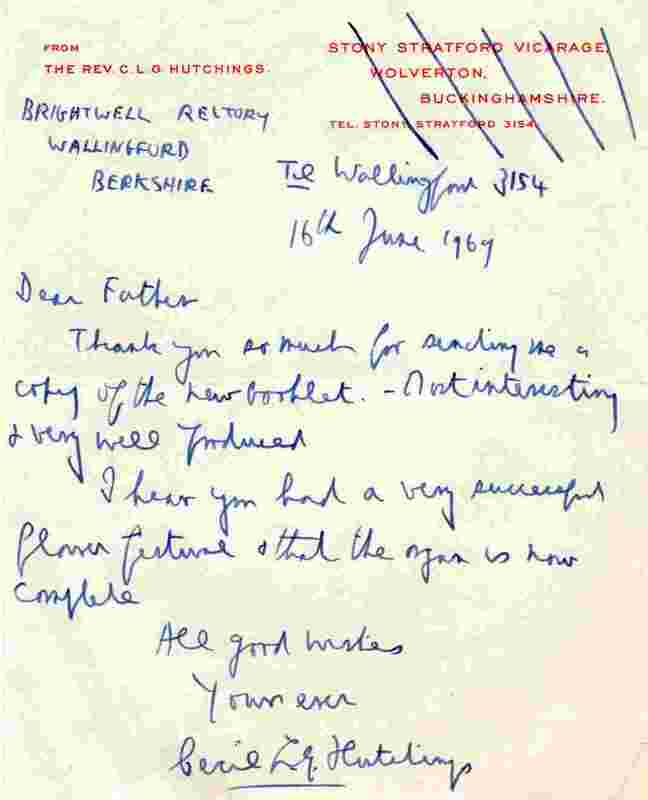 Also in May 1969 one of the people who had known, loved and played the Willis organ in St George's church, Mr J L Hope, came to visit it in its new home and wrote a letter to Fr Cavell afterwards, thanking him. The parallels between the Edinburgh and Stony Stratford parishes, which had both combined with sister parishes, was also mentioned in his letter.